I've been spending a lot of time on craigslist the past few weeks, digging around for good deals on a few specific things we need (and let's face it, a few things I want) on my iPhone while nursing Johnnie. When I spotted this funky old rocking chair for $50, I knew it had to come home with us. The base is a combination of iron, brass and wood, and the seat is vinyl and kind of feels like a soft old football you'd find tucked away in your high school gym's storage closet. I had no real idea whether it had value or a major manufacturer, but I knew the style was totally us. I justified it further by recalling that S had previously lamented the lack of a place for him to rock the baby, since the wicker rocker in Johnnie's room--which my my mom rocked me in as a baby--is rather delicate. Most importantly this thing is very comfortable. Meant to be, I say. The first thing I did when S brought it home--besides jump up and down--was to flip it over and check for a manufacturer, which turned out to be Lee L. Woodard, Inc. I learned that the company was known most for its wrought iron furniture and manufactured these chairs in the mid-20th century. (FYI Woodard still makes wrought iron furniture, though the Woodard family sold it off years ago.) This chair actually has a handwritten date on the tag, but the numbering doesn't make sense so I'm assuming they used an internal dating system or something. Or maybe I'm just sleep deprived? Google revealed that a chair like this in exceptional condition could list for over $1,200. One in good to very good condition runs from about $125 to $600. Ours is extremely sturdy and has all its original parts in tact, but it has very worn upholstery and some small dings in the metal base, so the $50 price tag is bargain but probably not a total steal. When I looked though, I could really only find a handful for sale on the internet--which is the most exciting thing to me. That there aren't many out there in circulation makes it more of a fun find. The roughed up upholstery does give it tons of the character I love, but I haven't ruled out the possibility of saving up my pennies and having it reupholstered (in leather) someday (years) down the road for even better comfort. 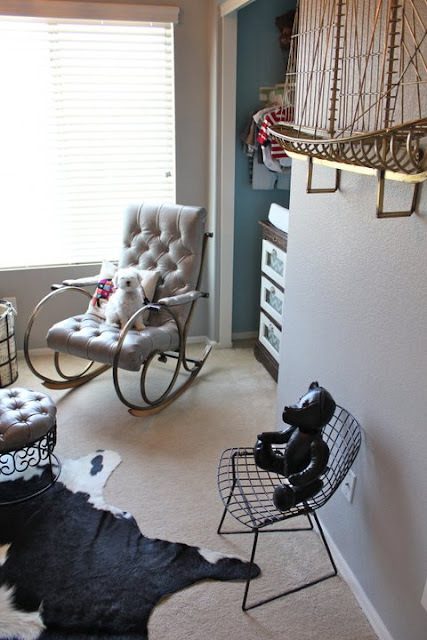 I spotted this reupholstered version in a nursery on dreambookdesign.com that looked so cozy. The owners of the nursery run a vintage furniture store in Phoenix called Modern Manor, and they apparently bought their chair from another dealer for $50 and had it recovered in leather. I still like the weathered old football look though, so maybe I'll leave it. Who knows. We have a lot of other things to do first anyway, so I don't even know why I brought it up. I have several years to waffle over the decision then second guess myself at the last minute... like I do. So that's my most recent craigslist victory. Thank you, craigslist iPhone app with your pictures displayed right on the main page! How about you guys? Scrounge up any cool treasures lately? What a great chair! Sadly, I haven't even been looking on CL so I haven't found anything. Once these renovations are done and I can start focusing on some other things, I'm going to investigate all the great thrift stores around here! Super cool! I've never seen one like it. Very fun! Wow that is an awesome chair! Ideal for a nursery. I think it would look great reupholstered. I would be willing to purchase this chair and give you a nice profit if you are interested.... Please email me if so! I have a dining table and four chairs from this same collection. Table base matches the metal dersign on this chair. I had two side chairs but (unfortunately) sold them several years ago. Bought the set new in about 1975. Would love to find more of these pieces.